Last summer, 13 garbage experts covered a 20-by-10-foot wall with sticky notes. As members of a state-sponsored subcommittee studying “organics,” they were preparing to tell Vermont’s Agency of Natural Resources what should be done with the state’s compostable waste. They had a lot of material to wade through. The subcommittee’s recommendations were rolled into a 92-page ANR study, “Life Beyond Garbage,” that will inform the next phase of Vermont’s solid-waste planning process. The study reports that the amount of waste generated by Vermont businesses, residences and institutions increased by 73 percent from 1987 to 2006, and that the average Vermonter generates nearly twice as much waste as he or she did 20 years ago. 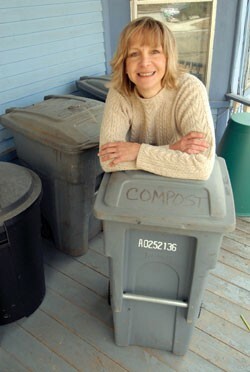 According to the study, every third pound of Vermont’s “municipal solid waste stream” is compostable. Among other measures, the study, which was released in early July, calls for an expanded composting infrastructure and a more comprehensive “perishable food network” — both of which seem incompatible with the state’s threat to close Vermont’s two largest compost operators. In Burlington, the Intervale Center is negotiating behind closed doors the fate of its 179-acre site with state officials. Despite a moratorium that exempts compost facilities from regulatory enforcement for two years, ANR officials reportedly want the center to pay more than $375,000 just to stay in business. Donna Barlow Casey, who chaired the organics subcommittee and is the executive director of the Central Vermont Solid Waste Management District, said closing the state’s two largest compost operations would be “horrific.” If either the Intervale or Vermont Compost were to close, she said, composters statewide would be discouraged from doing business for fear of prosecution. Gilbert is programs director at the Highfields Institute, a Hardwick nonprofit that promotes on-farm composting and soil quality. He said losing either of the state’s largest compost facilities would be a “setback” to the goals of the new ANR garbage study. “Life Beyond Garbage,” after all, predicts that Vermont could divert 100 percent of its organic material from landfills by 2023. “Life Beyond Garbage” addresses larger issues related to waste prevention. Reducing landfill waste cuts back on greenhouse gas emissions, the study noted, and a more comprehensive waste-recovery industry could produce 10 times as many jobs as currently exist in Vermont’s waste-disposal industry. The study has been forwarded to an ANR-appointed Solid Waste Working Group that includes representatives of the legislature, the Vermont League of Cities and Towns, as well as the private and nonprofit sectors. The 16-member working group’s first meeting was originally scheduled for February 15, but was delayed four months while the compost controversy festered. The group met for the first time on June 10. The group is expected to present a report to the state legislature in January that lawmakers will use to draft Vermont’s next 5-year solid waste management plan. The current one expires in 2011.